It has taken me 5 hours to write this post. I kid you not. I have been staring at this screen for way too long. Then I tried to read your awesome posts. It was immediately clear to me that accessing my Reader was not going to happen until the year, infinity. There are more photos that should be inserted right here, but after taking a long shower, straightening my curly frizzy hair (you know how long that takes), mowing the lawn and painting the house, they are still uploading…. Whatever you want to call it is fine with me. I have been so patient I am actually dead right now! I will be using my iPhone for all my social media needs until I figure out how to DESTROY the SBBOD SOB, for good. *Any suggestions will be greatly appreciated. Ahhh, wtf! So weird, I have ZERO answers for you. I am useless. I wish I had an answer, Maria. I haven’t downloaded any of the new Mac updates, because I’ve been hearing similar things all over the place. It probably is a WordPress problem, in that they have to do something to their platform to work with iOS 8, and they haven’t done it yet. So, I’ll sit on that update until I hear they’ve worked the bugs out of everything………..I hope you’ve resolved this problem by now. What a pain. After re-starting it 25 times and only keeping a few windows open at once, it’s gotten better. It definitely comes out more when I’m on IPhoto. I am sure I have way too many pics on that! Ugh!! I wish I had answers. What an annoyance!!! Honestly, sometimes I want to take a flame thrower to my devices. But that won’t solve your problem. . . . I don’t use Apple products, so I am not familiar with the SBBOD. Haven’t used a Mac since long before it even came along. See what I mean? I get teased by my father all the time about this, and he’s a straight up Windows user, except for his phone, which uses Android. Oh dear. I don’t think I’ve ever seen that thing. Be careful and make sure all your shots are up to date before coming into contact with that thing. Looks pretty dangerous to me. ROFL you know that iDevice crashes don’t work like that. Malware and computer viruses don’t even work like that! My Maria, oh Maria, Mrs. B! Houston, we have a problem. Did you download IOS8? I did on my iPad Air and now I can’t upload any photos on my blog posts with it! I have to put the freaking photos in on my iPhone 4 which I will not trade in for the 6 now because of this very problem. I went to the Apple story in the megamall with my iPad with the newly uploaded operating system and my blog platform ready to show them my error message and the greeter with the Garth Brooks/McDonald’s headset gave me a card with the AppleCare 800 phone number on it and sent me on my way to call from home, or told me I was welcome to come back eight hours later, at 8 p.m. So I called and the nice gent on the phone told had me go to camera roll and email a photo to myself. Since the attachment came through he said it was not an IOS8 problem but a WordPress problem. So he googled it, which I already had, and found nothing, which I already had, so he sent me a link to an app he said I could buy for 99 cents that would let me upload photos to WordPress. The app no longer exists. I don’t want to have to use an app to put my photos on WordPress. I’ve been doing it from my iPad without an app for 18 months. I find nothing on the WordPress forums about this. 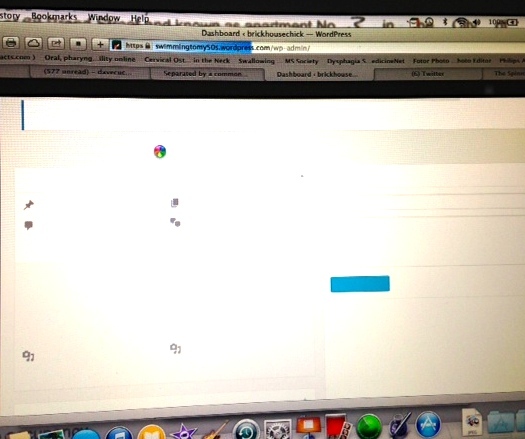 I think your Spinning Ball of Death and my JPeg Photo Error are related. Let’s get together and march on WordPress Central to get them to match up IOS8 and Dashboard. How about it wonderfully smart and funny Mrs. B followers? Help us please and thank you. Wait, y’all are relying on iOS rather than MacOS? Sorry, I have even *less* experience with that. Well, I’m not sure what Mrs. B is relying on Jaklumen, only what I uploaded on my iPad. I was assuming. Guess I was wrong about the Mac Book. I don’t have one. My bad. Out here. In case anybody else has an iPad and stoops to iOs, though, after I wrote my comment today, Apple sent me an update, I uploaded it, and it fixed the bug that apparently was causing my image upload problem on my blog. Yay. Sorry about that. I’ve been in a lot of pain and been rather cranky as a result. I really love technical diagnostics and troubleshooting. My weak spot right now really is Apple products… I just can’t afford them. There’s the Hackintosh sort of setups for desktop computers (running Mac OS on non-Apple hardware), but I’ve been told repeatedly it’s an exercise in frustration to set up. For the iDevices (iPad, iPhone, etc. ), I’m just straight out of luck, because to the best of my knowledge, there’s no way to run iOS if Apple hasn’t set it up specifically. You can probably tell that I just don’t touch Apple products much because the cost is just out of sight for me. But, I am glad that you got sorted. The nice thing about the price is that Apple usually takes excellent care of its customers. Usually. Most everyone I talk to that uses Apple’s products loves OneCare and other support from Apple. Because I’m just impoverished on a fixed income, I have to fix my own computers and wrestle with Linux. ‘Tis what it is. Thank you for your care and support on the issue, Jaklumen. I was very thrilled when Apple but the iOS8 bug fix out and it conquered my problem, for sure. So glad to hear that you got that bug fixed! I cleaned up some disks, erased some sites, restarted the computer and prayed. So far I haven’t seen the b**** ball, let’s hope. Next week I plan to take it to the Apple store for some guidance. Allow me to save you some time and grief, Mrs. B. Call your Apple store ahead of time to make an appointment, or, better yet, log on to Apple Care and make the appointment to your local store online. Or call Apple Care at 1-800-APL-CARE to see if they can talk you through the fix. Those are the two steps my Apple store greeter told me after I’d driven there, trying my initial patience somewhat. I hope you never see tjhe b***** ball again, Maria! YES! I too learned the hard way that one must make an appointment. Thanks. Jak, I thought of asking you directly because I know how savvy you are. I will be visiting Apple soon. Thanks for your efforts. Apple takes care of their customers- of that I am certain. I hope everything gets sorted quick. 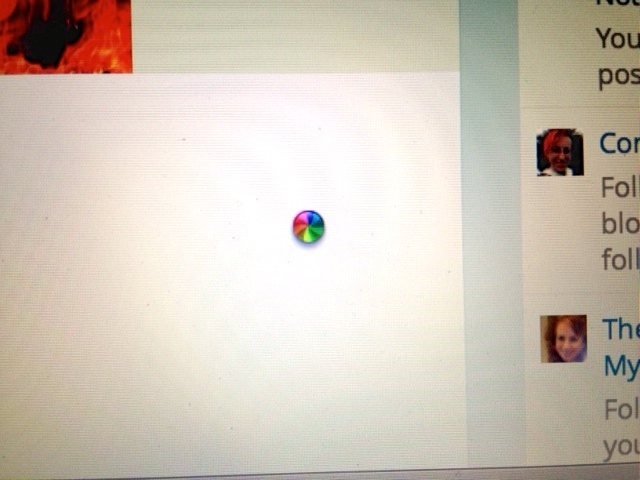 I loathe the effing, spinning wheel. And sadly, I’ve been seeing more and more of it on my computer lately. I keep restarting my computer and it goes away for a bit but ALWAYS comes back! GRRRRRRRRRR! My ball is actually little dots racing across the bottom of the screen….. …. …. …..
No color. Just there’s little black dots racing across the bottom of my screen. So frustrating! Why is this spinning thing making me take all my clothes off……. I think I better slowly back out of this post…..
New computer? That would solve your problem! Well, yes… there’s always that! How about the bitter ball of death. Because it was probably mine to think of. I am a computer moron… so I can’t help… but I feel your pain… I know how hard it is for you to be separated from my awesome blog… HA! I have a gift… what can I say? Start it in safe mode and run your anti malware programs. Try browsing in safe mode and see if you get a conflict. You may have a bad ram chip. Your computer is telling you it’s too busy to do what you ask. It’s either not got enough ram, or the ram is going bad or stuff is running in the background that is using resources. I avoid things made by Apple. Yes, I have a Mac Air. Thanks for the link, I will be checking it out in the morning. If you hear loud swearing in Spanish you’ll know it’s not going well. I probably would have thrown my computer out the window by now. That beach ball obviously doesn’t know it’s now officially autumn and that beach balls are no longer accepted in society. Tell that fucker to come back next June. Patience and consistency. The two most overrated “virtues” from hell.